If Russell Wilson wasn’t popular enough in Seattle, the Seahawks quarterback just gained an enormous amount of fans in the Emerald City. Wilson announced Monday that he has partnered with the Sonics Arena Group to help bring the NBA and NHL to Seattle. This is not the first time Wilson has pushed for the NBA to bring back the Sonics, who left Seattle to become the Oklahoma City Thunder in 2008. 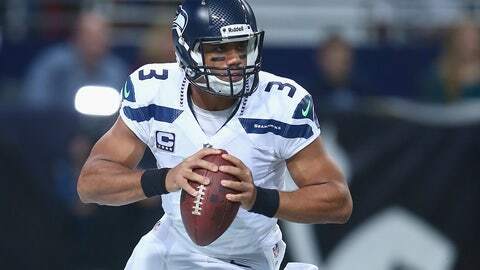 But his action Monday is the most tangible action the popular Seahawks quarterback has taken for the fans of Seattle, joining entrepreneur Chris Hansen in his bid to build a new arena. “We couldn’t be more thrilled that Russell is joining our partnership and continued efforts to bring the NBA and NHL back to Seattle,” Hansen said in a statement, via the Seattle Times. I'm excited to announce I've partnered w/ the Sonics Arena Group to help bring the @NBA & @NHL to the best fan base in the world. Baffling this amazing city doesn't have the #SuperSonics Bring them back! Seattle Loves Basketball! Seattle, Lets stand up & fight to get our team back! The stadium would sell out every game!